In principle one needs only a few milligrams of sample material, which should be as free as possible from water and solvent residues. If the sample material is very fine, then one can use it right away, otherwise man should pulverize it fully. One dabs the melting point tube with the opening into the sample material, turns it upside down and then taps the closed side on a firm base until the sample material falls downwards. If the sample material sticks to the tube and will not fall downwards, then it is most likely damp and should be dried. One repeats the dabbing and tapping of the sample material, until one has attained approximately a 4 mm fill level. One taps then again several times, in order to compress the material. The open side of the tube is then held in the flame of a gas burner until the material melts. The test tube is now ready. 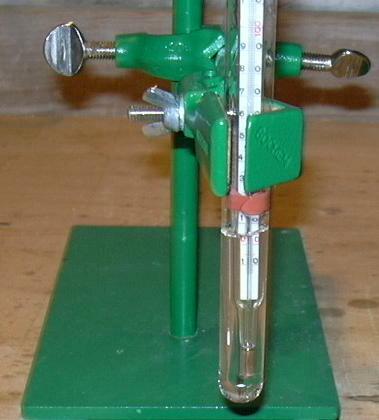 The thermometer with the melting point tube is now introduced into the test tube and fastened. The end of the thermometer must not touch the test tube! The melting point tube should also not be in direct contact with the test tube, as this will falsify the measurement. If one uses oil as a heating fluid, then it is advisable that the rubber not touch it, as it will hereby swell and give off some of its pigment into the oil. The test tube is heated from below, whereby a gas burner due to its very hot flame is inexpedient. Until about 10°C below the expected melting point one can vigorously heat, however, when near the melting point one should increase the temperature as slowly as possible, as only with this method can one achieve exact measurements! One must now monitor very carefully, since most substances, unless they are extremely pure, do not exhibit an exact melting point but rather a melting interval. The more the melting point is less than the expected value and the larger the boiling range then the more impure is the substance in general. If a substance in the process of being heated shows a yellow or brown discoloration, then it has most likely been oxidized during the process. One can prevent this if one melts in an evacuated melting point tube or fills it with an inert gas (both of which I have not tried yet...). A relatively inexpensive exact determination is possible with the Thiele tube. Specialized electrical devices are unfortunately very expensive, they do allow, however, an exact determination of the melting point up until over 400°C. Paraffin or silicone oil can, of course, be reused. It is practical to simply put a plug on the test tube after the experiment and store it. Suitable samples are, for example: naphtalene (80 - 82 °C, performed with water) or urea (132.5 - 133 °C, performed with oil).